The high pressure is situated to the southeast of the country with a light anti-clockwise flow, circulating the same airmass over the country all week and now into the weekend. The high pressure also acts as a block for any cold fronts coming from the west. Moreover, it prevents the atmosphere from reaching a state in which it can whip all this moisture into something that can produce rain. There are insignificant showers here and there where the afternoon sun manages to heat the surface sufficiently to create some uplift. On Friday and Saturday heat driven showers are expected to be present over inland areas of the country in the afternoon. A good amount of rain for the South Island is expected with this front during next week. Which will be welcome news for areas that are desperately waiting for more than a few drops of water. 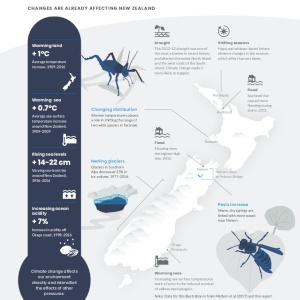 However, this system does not seem to bring relief from the muggy heat as more warm air moves onto New Zealand bringing unseasonably high overnight temperatures over the whole country.